Available in three wood styles, Maple (lightest color), Red Oak (medium color), Walnut (darkest color) and four sizes. Choose either a 3.5" x 5" or 4" x 6" acrylic photo holder, with our exclusive magnetized face. Your personally inscribed solid brass nameplate, available in four color styles, is included at no additional charge. 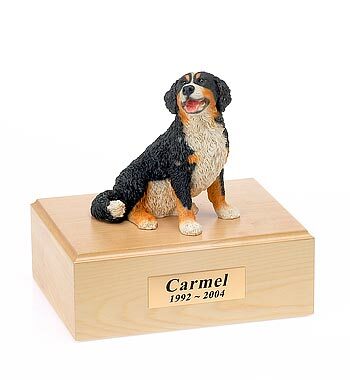 The Traditional Edition pet cremation urns are also available as Photo Memorials. Available in four sizes, your cat or dog urn can accommodate pets up to 120 lbs. and are available in three American hardwoods including Maple, Red Oak or Walnut. Their attractive finishes coordinate with practically any room decor. Your pet's photo is held in an acrylic photo holder, available in two sizes. The small frame holds a 3-1/2" x 5" photo, while our large frame holds a 4" x 6" photo. The frame is attached to the cat or dog urns in a "horizontal" fashion. 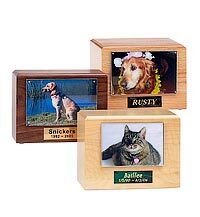 Traditional Edition wooden pet urns with your pet's photo are personalized with a solid brass nameplate including an inscription of your choosing. The inscription may be one, two or three lines. We provide a choice of nameplate colors to compliment your cat or dog urn. Select from Gold Bright Brass, Blue Marbleized, Brown Marbleized or Green Marbleized. For actual nameplate colors and inscription styles see the nameplates here. Your pet's bagged cremains are placed in the cat or dog urn via a removable bottom panel, secured by four screws. This bottom panel is covered in black felt and has four rubber feet to protect the surface where pet cremation urns are placed. Please refer to our FAQ page for directions on how to place your pet's cremains in your Traditional Edition pet urn. We did receive the urn and it is perfect. Although I hope to not need your services again anytime soon...in the unfortunate event that we do, I have your website saved as a favorite. And, I will not hesitate to refer family and friends to your website if they should need your services as well. Click on color swatch below to see enlargement at left. Click figurine links below to view at left.